It is early April and our group is leaving the Triqui village of San Miguel in the mountains of Oaxaca, Mexico, each of us wearing dark-colored, long-sleeved clothes and carrying a small, dark-colored backpack with one change of clothes, a plastic bag with coyote fur and pine sap made by a Triqui healer for protection and called a suerte [luck], along with many totopos [smoked, handmade tortillas] and dried beans to eat. I was instructed by Macario to bring these things. Each of us carries between $1,000 and $2,000 to pay for the bus ride to the border, for food at the border, for rides on either side of the border, and some for the coyote [border-crossing guide]. Our journey begins with a two-hour trip in a Volkswagen van from San Miguel to the nearby mestizo town of Tlaxiaco. After buying our bus tickets, we walk around the town's market, buying food to share with each other on the bus. Joaquin chooses mangoes, Macario oranges and peanuts, and I miniature sweet bananas. Macario buys a slingshot to use against rattlesnakes in the desert and asks if I want to carry one, but I don't have much experience with slingshots. When we return to the bus, the two nuns from San Miguel are waiting to wish us well as we board. The younger nun explains to me that they go there every weekend to pray for the border crossers. The bus ride in itself is exhausting. The bus is packed with people, mostly men, all headed to the border except a half dozen who plan to go to Baja California to harvest tomatoes. We ride from 3:00 P.M. on Saturday until our arrival in Altar at 4:00 P.M. on Monday, a total of forty-nine hours. We pass through five army checkpoints between the state of Oaxaca and the border. The checkpoints all have signs that say in Spanish, "Permanent Campaign Against Narcotraffic." Before each checkpoint, the bus driver or his assistant announces loudly that all the bus riders should say that they are going to Baja California to work so that the stop would not take too much time with questions about crossing the border into the United States. Each time, the driver tells me to say that I was just hitchhiking to the next tourist town-Mazatlán, Hermosillo, Guadalajara, depending on where we are at the time. Before each checkpoint, the bus becomes quiet, and people seem nervous about the possibility of being interrogated or sent back south. Two or three soldiers board the bus each time in green army fatigues and ask a few seemingly random people for identification and search a few bags while other soldiers look through the windows with rifles over their shoulders. Interestingly, there are three army soldiers riding the bus with us, going to their base in northern Mexico. They, as well as everyone else, play along with the story. The oldest of the soldiers, seated next to me, is convinced I am the coyote leading my friends to a job in the United States. He explains to me that these military checkpoints are paid for by the U.S. Drug Enforcement Agency in order to stop drug smuggling across the border and to stop undocumented immigration to the United States. He tells me to take the driver's assistant to "El Norte" for free since he is so nice to everyone on the bus. The driver's assistant-who collects fares from the passengers, enforces the schedule at the food stops, and makes sure everyone makes it back on board after meals-simply smiles in response. I reply that I am not a coyote. The soldier laughs and asks in Spanish, "Then why are you taking all these guys? For one and a half years full-time, followed by shorter field visits, I used the classic anthropological research method of participant observation in order to understand the complicated issues of immigration, social hierarchy, and health. This method involves long-term immersion in the everyday lives and practices of people while often including more specific tape-recorded conversations and interviews. Due to my interests in interactions and perceptions among different groups of people, I also collected media accounts of migration and reviewed clinical charts of migrant patients. This book corresponds to the "follow the people" multisited fieldwork outlined by George Marcus as one way to do ethnography that takes seriously the interconnections inherent in the contemporary world. For the first several years after 2000, I actively searched for an interesting and important ethnographic project to undertake. Given the critical social, political, and health issues related to U.S.-Mexico migration, I chose to work in this context. James, director of a nonprofit organization working with migrant laborers in the Skagit Valley of Washington State and an acquaintance through mountaineering networks, encouraged me to work with the Triqui people from San Miguel, Oaxaca. He explained that this group of people was especially interesting and important because they had only recently begun migrating to the United States, had a reputation for being violent, and lived and worked in unhealthy environments in Washington State and California. In spring 2003, I decided to visit San Miguel, the rural hometown in the state of Oaxaca of many Triqui migrants in Washington and California. San Miguel is located at an elevation of almost nine thousand feet and has approximately three thousand inhabitants. During most of the year, however, almost half of them are in the United States, working. Upon arriving in Tlaxiaco, the nearest primarily mestizo city, I was told by several residents not to go to San Miguel. By long-term Protestant missionaries, waiters, and drivers of suburbans (eight-passenger vans providing rides between towns), I was told explicit and detailed stories of people being kicked out of San Miguel, being shot, or having their cars stolen. After getting off the suburbanand walking up the several-mile dirt road to San Miguel, I approached la presidencia (the town hall). I told the four men there that I was a friend of James, the social worker and chaplain in Washington State. I was greeted with cold silence, followed by the authorities speaking quickly in Triqui that I was not able to follow, and then one of them asked, "¿Cuál Jaime? "(Which James?). When they seemed convinced we knew the same James, the man with the white plastic sombrero invited me to his house to eat. We walked up the dusty hill in silence, as I wondered what I had gotten myself into. I tried various questions like, "For how long have people from San Miguel been going to the U.S.?" "Have you heard of a social movement called the MULT here?" "When was the first time you went to the U.S.?" I was greeted with dusty wind and silence. The whole meal proceeded the same way, in silence. Afterward, I thanked the man and his wife for the food and returned to the main road, where I would catch the next passing suburban. After returning to the United States and processing this experience, I remembered Eric Wolf's article describing "closed corporate communities" in Mesoamerica. According to Wolf, due to pressures from Spanish conquerors, indigenous groups separated themselves from each other in language, dress, and trust. Latin American indigenous communities became suspicious of all outsiders. I decided it would not be easy, perhaps impossible and even dangerous-as several people had suggested-to begin my fieldwork in San Miguel. With the help of James and one of my childhood neighbors who now lived in the Skagit Valley, I began my fieldwork in northwestern Washington State. My childhood neighbor had become the pastor of the church attended by the president of one of the larger farms in the region. She helped me get permission from the farm's president to live and work on the berry farm. James and his coworkers introduced me to several families of Triqui, Mixtec, and mestizo Mexican migrants in the area. With this tenuous entrée, I moved into my one-room shack in the farm's largest migrant labor camp in early summer 2003. I lived there the rest of the summer and fall, surviving the labor camp conditions described by one close friend as "one inch above squalor," squatting down all day picking berries with the rest of the people from the camp, slowly getting to know migrant workers and other farm employees, and observing and interviewing migrant clinic workers and other area residents. In November I accompanied an extended family of twenty-three Triqui people as they drove from Washington to the Central Valley of California. We drove below the speed limit in a caravan all night, eating homemade tacos and napping at rest stops along the way. We spent a week homeless in Madera, California, sleeping in our cars and washing ourselves in city parks. Each day we drove the town's street grid looking for housing until we found a three-bedroom, one-bathroom slum apartment. That winter, nineteen of us shared this apartment, looked for work, visited the local migrant clinic and Department of Social and Health Services, and occasionally found work pruning grapevines. I spent spring 2004 living in San Miguel, Mexico. I lived in a partially constructed house with the extended family of Samuel: his father, who did not know his exact age but considered himself old (viejo); his twenty-eight-year-old sister; and his nieces and nephews, who were considered too young to cross the border with their parents. The house was made of plain concrete slabs built piecemeal with money sent by Samuel, who remained working in California. Along with Samuel's family, I used the snake-inhabited latrine, visited the government health center when sick, carried water from the well, harvested and planted corn and beans, and took the bulls and sheep to pasture. During this time, I experienced more intimately the "closed corporate community" aspect of this town. This rural Triqui town proved to be very suspicious of and unfriendly to me early on. I was repeatedly warned about violence by townspeople themselves as well as accused of being a spy for the U.S. police. A handful of times, I was threatened with being kidnapped and put in jail explicitly because "gabachos should not be here." In April 2004, I accompanied a group of nine young Triqui men from San Miguel as they prepared to cross the border (la línea), trekked across the desert into Arizona, and were apprehended by the Border Patrol and put in Border Patrol jail. They were deported back to Mexico, and I was eventually released with a civil offense and a fine. I spent the rest of the month conducting interviews with border activists, Border Patrol agents, border residents, and vigilante members. In May I met up with my Triqui companions in Madera, California, after all but one of them had successfully recrossed the border. I spent the rest of May living in Central California in another slum apartment with Samuel and his extended family, and then we all migrated back to Washington State. I spent that summer living in the same shack in the same labor camp as the year before. As I continued in my medical training and worked on this book over the next several years, I returned to visit my Triqui companions in Washington, California, and Oaxaca on numerous short trips and kept in touch over the phone. Three times a day, the bus stops. Two stops a day for food, each time for thirty minutes at a roadside restaurant I would never choose to visit. The restaurants are dirty, with flies all over and a few workers trying frantically to get food for all of us. I begin feeling sick before I even eat the food because of the smells and unsanitary sights. There are two or three choices of food that all entail meat, rice, and soda. Each time, I eat with four of my Triqui companions from San Miguel, including Macario and Joaquin. We take turns buying meals for each other and then eat all together, usually standing up since there isn't enough room to sit. The driver and his assistant are given free meals in exchange for bringing all of us to these restaurants. The conversation during these meals most often revolves around past experiences of violence and suffering on the border. Everyone appears to be on edge, nervous about what might lie ahead. People talk about whether or not we will be caught by the Border Patrol and whether or not we will die trying to cross. Once a day, we stop to fill the bus with gas as we all attempt to use the restroom as fast as possible. These restrooms most often have two stalls for a bus full of over thirty men. As I sit on the toilet, people often say to me, recognizing my shoes under the stall door, "Hurry up, gabacho!" or "Finish, already!" They say the same things to anyone else they recognize by their shoes. Some of the stalls have no doors such that the line of waiting people directly faces the person on the toilet. The bus drives throughout the night, and we all try to sleep as much as we can since we know we will need all the energy possible for the upcoming desert trek. The bus is reminiscent of one that may have been owned by Greyhound decades earlier, the seats reclining only two or three inches. It is cramped, full of people and small backpacks, as well as fear and anxiety. During the first year of my fieldwork, over five hundred people died in the Tucson sector of the border alone. Most died of heat stroke and dehydration, some from direct violence. Migrants face many mortal dangers in the borderlands. There are Mexican and American assailants and kidnappers after their money; heat, sun, snakes, and cacti after their bodies; armed American vigilantes after their freedom; and Border Patrol agents after their records. My Triqui companions often explain their everyday lives in terms of sufrimiento (suffering). But one of the sites of sufrimiento most frequently described by Triqui migrants is crossing the border from Mexico into the United States. Many times throughout my fieldwork, my migrant companions told me stories of their harrowing experiences. One of my friends was kidnapped for ransom with her four-year-old boy. They escaped with one other hostage through a window from the house where they were held captive for several days in Phoenix, Arizona. They found a pay phone and called their relatives in California, who immediately drove to pick them up. One young man I know described burns on his skin and in his lungs after being pushed by his coyote into a chemical tank on a train. Another man explained that he was raped by a Border Patrol agent in exchange for his freedom. All my migrant companions have multiple stories of suffering, fear, danger, and violence at the border. Early in my fieldwork, I realized that an ethnography of suffering and migration would be incomplete without witnessing firsthand such an important site of suffering for Latin American migrants. I had read several powerful accounts of border crossings. However, there have been very few firsthand accounts since the significantly increased militarization of the border after 9/11, and most of these are rather limited. For example, the Pulitzer Prize-winning "Enrique's Journey" published in the Los Angeles Times in 2002 (September 29) involved powerful photographs and stories from a train ride through Mexico to the border, but the photographer and his team did not actually cross the border with the Mexican and Central American migrants. I began asking Triqui friends what they thought of the possibility of my crossing the border. They warned me of robbers, armed vigilantes, rattlesnakes, and heat. At the same time, they reminded me that the border crossing is a principal experience of sufrimiento that I should understand and began introducing me to people who might let me cross with them. In addition, I communicated with lawyers in the United States about this idea. They warned me about death by dehydration and sunstroke, death by kidnapping and robbery, and death by rattlesnake bite, as well as the possibility of being mistaken for a coyote and charged with a felony. One of the lawyers from Arizona, who specializes in immigration and the border, told me sternly not to cross but gave me her cell phone number in case I decided to try. Finally, I spoke with my family and friends. My mother shared my desire to understand inequalities and to work toward their amelioration. At the same time, she became quite scared for me. She made me promise to call her immediately after crossing so she would know I was still alive and safe. After considering the dangers and risks, I began looking for a group of Triqui people whom I could accompany across the border. In March 2004 I was invited to cross the border into the United States with a group of Triqui men. We planned to start together in the village of San Miguel, take a bus north through Mexico, and then trek through the border desert into Arizona. The group included nine young men from San Miguel and one from a neighboring Triqui village. Two of the men were in their late teens, hoping to enter the United States for the first time. One of these young men was the nephew of the coyote we planned to meet at the border for the final leg of the journey. The remainder of the men were in their mid- to late twenties and were returning to California. These men left their families in different agricultural areas of Central California to return home to San Miguel, share money with their relatives, help with the corn harvest, and attend the village's patron saint festival in November. One of these men, Macario, was my neighbor in the labor camp shacks in Washington the previous summer. He was a twenty-nine-year-old father of three, with a reputation for being one of the fastest strawberry pickers. I remember being invited, during the first few months of my time in the labor camp, to his baby daughter's baptism party outside his shack. Macario's two youngest children, born in the United States, were in Madera, California, with his wife. His two older children lived in San Miguel with his parents to attend elementary school there until they were old enough to cross the border themselves. Over the few weeks prior to our departure, Macario introduced me to several of the others in the group. Joaquin was Macario's good friend and planned to return to his wife and baby boy in a berry-growing region along the coast of Central California, close to Watsonville. I had already tried unsuccessfully to join other groups from San Miguel crossing the desert into the United States. One coyote told me a time to meet him to go with his group on a weekend morning, but when I arrived at his house it was locked and empty. I heard from my Triqui friends later that this man had wondered if I might be a spy for the U.S. Border Patrol and decided to leave without me. Every Saturday in March and April, a full bus of border crossing hopefuls leaves the small town of Tlaxiaco. Each of these buses includes one or two groups of five to ten people from San Miguel planning to cross. As I left San Miguel to start the journey north, almost all the Triqui people I knew from Washington and California had already returned to the States. Most people-including all the women and children-attempt to cross before the desert gets too hot in late April and May. Our trip was saturated with anxiety and fear, and it was under rather ideal circumstances: trekking with all healthy, young, fast hikers. Many groups with older or younger migrants from San Miguel hike three to five days through the desert. In addition, my Triqui friends are fortunate to cross with coyotes from their hometowns, people they know, sometimes extended family members. In general, this brings more trust and safety. Those who arrive at the border-for example, from South or Central America-and search for a guide in one of the border towns cannot know if they will find a coyote or a con man. Altar, the desert town where we stop in northern Mexico, is small, with several hundred residents and probably two thousand others preparing to cross the border. As the bus approaches Altar, the bus driver tells everyone to get their backpacks and get ready to disembark. Outside of town, at an abandoned gas station, he makes all of us quickly jump off and walk into town because "Altar está caliente" [Altar is hot]. Macario says to no one in particular, "De por si, Altar es caliente" [That's how it is, Altar is hot]. This brings nervous chuckles from those within earshot. "Caliente" in this context means both "hot" and "dangerous." Laughing quietly, perhaps to cover up our anxiety, we enter the scorching sun, curse the bus driver for dropping us off so far away, and follow one of the young men in our group. He is the nephew of the coyote we plan to meet in town. My skin is already peeling from the dry, hot wind in the bus and the sun that came in through the window. Now, I begin sweating profusely. This town scares me. It's impossible to know which person dressed in dark clothing is an assailant wanting money from easy targets and which is a person hoping to cross the border. Macario tells me to guard my money well. He remarks, "People know how to take your money without you even noticing." I push an empty soda bottle in my pocket above my money, and I feel a bit safer. There are people, mostly men, from all over Mexico and Latin America; some appear to be chilangos [people from Mexico City] but most look like campesinos from rural Mexico. The only shops in town are small moneychangers, a Western Union, a few restaurants, grocery stores with aisles full of water bottles and Gatorade, and open-air markets full of dark-colored clothing and small backpacks. I try to figure out when to mail the three anthropology textbooks I carry in my backpack to my address in the United States so I won't have to carry them on the trek. The Catholic church at the center of town has hand-drawn posters along the inside walls facing the pews describing the many dangers in crossing the border: rattlesnakes, scorpions, desert insects, several species of cacti, dehydration, heat, and assailants. Each poster asks in bold, red letters in Spanish, "Is it worth risking your life?" The church has a small side room where people light candles and pray for safe passage. Macario and I plan to do this but run out of time. Everything is so clearly and obviously set up for border crossers in this town. I wonder to myself why the whole operation hasn't been shut down by the U.S. Border Patrol if their primary goal is really to stop undocumented entry. As described by the sociologist Michael Burawoy, systems of migrant labor are characterized by a physical and temporal separation of the processes of reproduction of the labor force and the production from that labor force. The migrant laborer can survive on low wages while contributing to economic production in one context because the family, community, and state in the other context provide education, health care, and other services necessary for reproduction. In this way, the host state externalizes the costs of labor force renewal and benefits even further from the phenomenon of labor migration. In the case of my Triqui companions, this analysis holds well, as primarily healthy young men and women come to the United States to work after being raised and educated in Oaxaca. Beyond Burawoy's analysis, my Triqui companions often return to their hometown when they are unable to work due to old age, sickness, or injury. Thus that which is necessary for both reproduction and convalescence is provided in Mexico, and the United States provides only what is necessary while the migrants are working. The separation of these processes is not a natural or a voluntarily chosen phenomenon but must be enforced through the meeting of contradictory political and economic forces. Systems of labor migration involve economic forces inviting and even requiring the cheap labor of migrants at the same time that political forces ban migrants from entering the country. Such systems must include a set of political and legal mechanisms that presuppose that the migrant is without citizenship rights and has only limited power in the state of employment. The reproduction of a system of migrant labor hinges on the inability of the migrants, as individuals or as a group, to influence the institutions that subordinate them to the other fractions of the labor force and to the employer. Ever renewed and updated legal, political, and symbolic separations produce the maximal extraction of labor as well as the inherent suffering and danger linking one side of the border to the other. Such separations include Proposition 187 in California and similar initiatives in Arizona and Colorado that make it legal for U.S. companies to pay workers only enough for daily survival and illegal for federal money to go toward their health care, education, or other social services. The man leading our group takes us down a residential street several blocks and then into a doorway. It opens into a one-room apartment with no furniture. This is where we will stay until our coyote arrives. The damp concrete floor is covered in several places by swaths of old, grimy carpet, presumably for sleeping. The bathroom has no water service and reeks of old garbage and urine. The shower behind the apartment is made of a hose connected to an iron rod with wet sheets for minimal privacy and a mud floor. The shower is shared by several apartments with back doors to the same yard. We eat our food in the backyard on the cement that has stains and pieces of rotten food. A skinny, yellow cat meows at us, hoping for handouts. As we sit in the hot, smelly apartment, every hour or two someone walks in unannounced. First, our coyote, who had been working in the United States, arrives and greets everyone in a mixture of Triqui and Spanish. He explains that we will leave the next evening, and then he goes out to get us all food. Macario goes with him to explain who I am and why I am there. I am nervous, wondering if this might be the end of my journey with the group. Macario returns later and tells me that he explained that I am a student who wants to experience for himself how the poor suffer. The coyote agrees to let me come along and says he will not charge me since I am trying to do this to cooperar [lit., "cooperate," though with more of a tangible, material meaning, like doing one's part or paying one's share for a group expense] with those who suffer. Later comes a middle-aged Mexican man who tells us that he owns the place, asks which coyote we are with, and tells us we have to pay him to stay there. One man pays him; the rest of us keep our money hidden and tell him our coyote will pay him. As he walks out, he asks if we are hot, and a few reply in the affirmative. He turns on the hollowed-out air conditioner which is now just a see-through fan with no protection from the spinning blades. Another man walks in a couple times and asks where our coyote is by name. One of us asks who he is, and he replies, "Your raitero [driver] for tomorrow." He asks me who I am several times and seems nervous about me being there. He tells my friends that they cannot be sure that I am not a spy for the migra [Border Patrol] or the police. I silently ponder words. Raitero, the word used to denote our van driver, sounds unnervingly like ratero, which means "assailant" or "robber." The semantic confusion comingles in my mind with my tangible uncertainty about the identities and intentions of everyone we meet. Several hours after we go to sleep-in the wee hours of the morning-three young men walk in, turn on the bare lightbulb hanging from the ceiling, and talk loudly to each other for what feels like hours. I hide under my blanket to avoid drawing attention to my white self. In the morning, one of them announces that they are from Michoacán, that they tried to cross the day before and were deported. One slept on the seat from a van in the middle of the floor. They are much louder than any of my Triqui friends, who watch them in silence. The men from Michoacán change the TV channel from the one we had been watching, and I speak up; their disrespect of my companions pisses me off. Later, Macario tells me they are rateros and that is why they act so rude. We did not rest well. After our forty-nine-hour bus ride and this night of intrusions, I am fatigued and wonder if this desert trek is doomed before we even begin walking. The next day, we walk through town, some in our group call their relatives asking them to wire money because they do not have enough, and we all buy gallons of water and Gatorade. Our coyote directs us to buy mayonnaise to put our money in so that it is hidden if we are attacked by rateros along the way. Apparently, we are not the only group doing this since the grocery store has aisles and aisles of each of five sizes of small mayonnaise jars. Every time we run into other people from our bus from Tlaxiaco, they wave or greet me. They all seem to think I am a coyote, and several ask me when I will take people north. Macario and his friends tell me to joke around with the others and offer to drive them to Arizona for two thousand dollars. I am too focused and nervous for this kind of game. After the preparations, we wait-trying to play cards-for our ride. In the afternoon, a man I don't know comes in suddenly and tells us to run out the back of the apartment for our ride. The man who said I might be a spy earlier looks at the driver of the tan van behind the apartment and says in Spanish, pointing at me, "See what I mean?" The driver is a tall, light-skinned Mexican man wearing a cowboy hat, clean jeans, and a button-down shirt. The ten of us pile into the farthest back seat of a twelve-passenger van already holding thirteen people, for a total of twenty-three adult passengers. Joaquin finds an old teen tabloid magazine behind the seat, reads it out loud, and laughs. That lightens the mood some. We drive very fast, without air conditioning or vents, for approximately three hours along dirt roads through the desert sun. Dust from the desert road filters in through the top of the closed windows and lands on our sweaty skin and clothes, turning us slowly more beige from head to toe. During this time, we pass at least two buses, ten other vans, and a handful of cars and pickups headed back toward town. The driver tells us it is caliente today and that he is nervous about getting caught. Suddenly, after three hours on the road, the driver swerves off the road into the cacti and drives even more quickly through soft sand. He stops at a small outpost of a few houses made of bricks, cardboard, and tin piled together without mortar. Outside, there are several light-skinned mestizo men with cowboy hats and large pistols talking in the sun, squatting on concrete blocks and overturned buckets. I feel like I am entering the Mad Max movie with Tina Turner and crazy motorcycle cage fighting: an outpost of lawless rebel gangs with large guns and makeshift shelter. Some of the men turn and watch me as I get out of the van. I clearly stand out. I move into the shade, hoping to hide from the sun and their watching eyes. Our coyote leaves with the driver for about a half hour without explaining to us what is happening. We stand together silently, waiting, thinking. Again, I worry about the identity and intentions of everyone we meet. Which of the men outside is trustworthy? Which is an armed ratero ready to steal our money, knowing that we each carry a large sum of cash? Could this whole situation be a setup? Without explanation, our coyote motions for us to pile into the back of an old pickup truck with two other men. The floor has several cracks and holes large enough for us to see through clearly to the desert below. We ride standing up, looking alternately ahead and through the floor below for over an hour. Every once in a while we seem to be followed by another car. The pickup seems to take several unnecessary detours only to return to the main road once again. At this point, there is no option but to go forward. A few minutes after we drop off the two other men at a smaller outpost, a camo-colored Humvee of the Mexican Grupo Beta (the Mexican Army organization whose mission it is to stop border violence against migrants) stops and asks us-especially me-questions. Luckily for me, one of the Grupo Beta soldiers is from Oaxaca and knows that I answer all the geographic questions about where I was in Oaxaca correctly. My friends from San Miguel support my story as well. The soldier looks at my passport and seems satisfied, "To my countrymen, good luck; to my friend from our sister country, God bless." Traditional studies of migration focus on the motivations for an individual to choose to migrate. These motivations are often categorized as "push" and "pull" factors. "Push" factors are understood to be located in the "sending community" and include such things as poverty or racism in the hometown of the migrant. Conversely, "pull" factors are located in the "receiving community" and include such aspects as social networks and economic opportunities. Many experts who study what are called "risk behaviors" in the field of public health might say that these push and pull factors are weighed in the individual's "decisional balance" when this person chooses whether or not to engage in a risky behavior. Such a view assumes a rationally acting individual, maximizing her self-interest and having control over her destiny through choice. Minimized in these analyses is a focus on the central importance of structural context and the ways in which structural forces constrain and inflect individual choice and direct the options available to people. As discussed further in the concluding chapter, much of traditional migration studies assumes a dichotomy between voluntary, economic, and migrant on the one hand and forced, political, and refugee on the other. The logic behind this dichotomy states that refugees are afforded political and social rights in the host country because they were forced to migrate for political reasons. Conversely, migrants are not allowed these rights because they are understood to voluntarily choose to migrate for economic reasons. The "push and "pull" factor school of migration studies tends to assume that labor migration is entirely chosen, voluntary, and economic. However, my Triqui companions experience their labor migration as anything but voluntary. Rather, they have told me repeatedly that they are forced to migrate in order for themselves and their families to survive. At one point during our trek across the border desert, Macario told me, "There is no other option left for us." The pickup drops us off in the middle of the desert. We thank the driver and walk over to the tall cacti to hide in their partial shade. Our coyote sneaks ahead for several minutes, then comes back and tells us there is a lot of Border Patrol activity and we need to wait here. We sit in a circle, and a few people pull out their food and we all share their totopos and dried beans. It feels good to share food with each other. It feels like family, solidarity, almost like a communion ritual before a dangerous trial of biblical proportions. Two people in our group have diarrhea and ask me for antidiarrheal pills I have in my bag. One sprained his ankle the week before on a hill by his house and asks for ibuprofen. Each time we hear the sound of an automobile, we know it could be assailants or other migrants planning to cross. We sit silently on edge. Macario pulls garlic cloves out of his bag and rubs one on his boots. He instructs me to do the same to keep away the rattlesnakes. After an hour of nerve-wracking waiting, we put on our backpacks and follow the coyote in a single-file line farther into the desert, toward the north. I can see another single-file line of Mexican border crossing hopefuls walking in the distance as the sun begins to set. Deep in my pocket, I hold my suerte tight. The coyote tells us to duck down and wait. He walks ahead, then motions down low with one arm, and we all run as fast as we can to and through-mostly under-a seven-foot barbed-wire fence. We run across a sand road and through another barbed-wire fence and keep running until we cannot breathe anymore. Now we walk quickly. It is around 6:30 P.M., and the sun just finished setting. We do this at least ten more times-through, under, and over tall wood and barbed-wire fences. Though I am a runner and backpacking guide in the summers, we move faster than I have ever moved without taking breaks. My mouth gets dry quickly as I hike, and I drink through a gallon of water every few hours. I carry five gallons of water and several bottles of Gatorade and Pedialyte. We continue walking and running, occasionally ducking under or climbing over fences. We pull cactus spines out of our shins from cacti we did not see in the dark night. We walk without talking, just breathing loudly and thinking. I think of the mountains to our right and how the desert might be beautiful under different circumstances. I hear a dog bark and think of the towns to our left and how the people living there are likely asleep and comfortable. Macario tells me we are in Arizona now. I see no difference. After hiking several more hours, we stop in a dried-up creek bed. I am thankful that there are no hidden cactus spines when I sit down. Again, we sit in a circle, three people pull out food, and we all share. We rub garlic on our shoes again and a few of us ready slingshots in our hands. The moon is almost full, and the desert is eerily quiet. After hiking and running another hour, we hear a helicopter. I try to hide under tall cacti. Joaquin tells me not to look at the chopper because it can see my eyes. I remember that Triqui hunters in the mountains of Oaxaca use flashlights at dusk to find the eyes of rabbits in order to shoot them. I feel like a rabbit, vulnerable and hunted. Macario hides under a cactus that has a rattlesnake rattling at him, but he does not move for fear of being seen. The helicopter flies off into the distance until we barely hear it. After two more hours of hiking, we stop again in a dry creek. One of the younger men enlists help pulling large cactus spines from one of his legs. We sit in a circle sharing food. Two people share cooked grasshoppers from the open-air market in Tlaxiaco. The tastes link us to loved ones and Oaxaca. After we have hiked through blisters for many miles and I have shared all my ibuprofen with the others, we stop to rest in a large, dry creek bed under the cover of several trees. We fall asleep, using torn-open plastic trash bags as blankets. Our coyote leaves to talk with his contact on a nearby Native American reservation about giving us a ride past the second border checkpoint to Phoenix. He returns, anxious, telling us his contact no longer gives rides because of the increased Border Patrol activity. We discuss pooling our money and buying a car to drive ourselves or looking for someone else to drive us. Two of the men try to convince me to drive them into Phoenix, past the internal Border Patrol checkpoints. I tell them that would be a felony and would mean I would go to prison and lose the ability to work. They seemed satisfied by my response, respecting the need to be able to work. After we decide to look for another ride, our coyote sneaks off to look for a different driver. We wait for a few hours. We rest quietly, drink Gatorade, and brush our teeth in the creek bed. Suddenly, our coyote runs back speaking quickly in Triqui. Two Border Patrol agents-one black and one white-appear running through the trees, jump down into our creek bed, and point guns at us. As I rested in the creek bed, I remember being haunted by the church's posters. "Is it worth risking your life?" At first blush, it seems clear that for the thousands who cross the border to work in the United States, the answer is a resounding "Yes." However, taking this question at face value misses an important opportunity to question its framing. As Judith Butler points out, frames shape our perceptions of an entity. Frames allow an entity to break from its original context in order to be meaningful in other times and spaces. Like much of the media discourse about migrant deaths in the borderlands, the question, "Is it worth risking your life?" frames the crossing of the border as an individual choice, a choice to take on mortal risk. In the United States, this framing is used regularly to justify a lack of grief for those who die and a lack of action to achieve meaningful equality and change. However, the reality of survival for my Triqui companions shows that it would be more risky to stay in San Miguel without work, money, food, or education. In this original context, crossing the border is not a choice to engage in a risk behavior but rather a process necessary to survive, to make life less risky. The agents tell us in Spanish to put our hands up and not to move. They instruct us to take out any pens, knives, and toothbrushes from our bags and leave them on the ground and then raise our hands in the air. The agents separate me from my friends and lead us all toward the road, leaving scattered pens, nail clippers, toothbrushes, and other items littering the desert. We wait on the curb outside a church to be taken to Border Patrol jail. The white Border Patrol agent says to me in English, "This doesn't look good for you, with a bunch of illegals. "He asks who I am, and I explain I am a medical and anthropology student working on my thesis and show him the letters I brought from school and my passport. The agents call their supervisor to let him know that they caught a "U-S-C" [U.S. citizen] with a "group of illegals." The supervisor arrives thirty minutes later and interrogates me. He stands above me and raises his eyebrows, reminding me of an angry, patronizing schoolteacher. He puts me in the back of one Border Patrol truck and my friends in another. My truck stops once to pick up two Guatemalan men who were just apprehended, once to let us urinate on the side of the road at my request, and once to take one of the two agents to the nearby Indian Health Service hospital to be treated for a rattlesnake bite he sustained as he chased us. The air-conditioning unit is not working in the back cell of our truck, and it feels like we are baking inside. While we wait in the back of the truck at the Indian Health Services hospital, I bang on the windows and ask the agent who is walking by to do something about the rising heat. He cracks open the back door and secures it with handcuffs. As we are led into the jail, Border Patrol agents shake their heads at me and ignore my companions walking by. An older man, who appears to be in charge, stares me in the eyes and asks, "Do you really think your thesis is worth breaking federal law? "Part of me wants to say that it is not just for a thesis, but to understand migration and help work for positive social change. Part of me wants to explain that I consulted with immigration lawyers and knew all the legal ramifications of my actions and decided ahead of time it was worth it. I lower my gaze and say sheepishly, "I guess not." I don't want to make him angrier than he already seems to be since he is in control now. He tells me they are booking me for "alien smuggling," and if that does not hold they will get me for a $5,000 fine for "Entry Without Inspection." I know the charge of alien smuggling is unlikely to stick, but it freaks me out. I know Entry Without Inspection is a civil offense and am not too worried about that on my record. As though reading my thoughts, the agent tells me that Entry Without Inspection is what drug smugglers are charged with and that will make it difficult for me to travel ever again. I wonder to myself why the agents seem so focused on and angry at me when there seem to be much more clearly dangerous criminals in the borderlands on whom they could focus their time and energy. I wonder why they are charging me with alien smuggling if they all seem to admit they knew I was doing this "for my thesis." After all, I think to myself, what crazy smuggler would carry heavy anthropology textbooks as well as letters from university officials explaining his plans? Once in jail, my Triqui friends are put in one cell and I alone in another. After being held in my cell for a few hours and singing childhood Sunday School songs to myself to try to distract myself, I notice that my Triqui companions are being led single-file past the front desk, being fingerprinted, and having their photos taken. I wonder what this will do to their possibilities of applying for green cards in the future. I remember reading in the pamphlet given to us by Grupo Beta that I have the right to one phone call as well as food and drink every six hours. I decide I want to call one of the immigration lawyers with whom I had already spoken. I look at a female red-headed agent through the window and motion like I am talking on the phone. The agent simply forms her mouth in the shape of "no" and looks away. I make the same motion to a young male agent, and he quickly shakes his head and furrows his eyebrows. Three different times, agents walk up to my cell and shake their heads at me exaggeratedly and walk away. One tells me not to look at the cell where my friends are sitting. Apparently, he is afraid of what we might communicate with our faces. At one point, I count fourteen agents looking on as one of them rummages through my backpack, examining my camera, tape recorder, anthropology books, passport, and letters from people in San Miguel to loved ones in the United States. I read the scratches on the door in my cell. Many are from women to their loved ones. Many of the messages are addressed to specific people: sisters, friends, husbands, children. I wish I had a pen and paper to write them all down. Instead, I read them over and over, trying to memorize them. I see many versions of the same Spanish phrases "100% Mexican" or "proud to be Mexican," along with statements like "don't lose hope," "God will care for you," "don't let them get you down." There are also many messages of return such as "I'll be back as soon as they drop me off" or "see you in Chicago. "Unexpectedly, these messages comfort me. When a young Latino agent comes to my cell to ask permission to look at the pictures in my digital camera, I tell him I should be allowed to talk with my lawyer. He takes me to the front desk and fingerprints me in front of the other cells of apprehended migrants. Several agents look on idly as I call the Arizona lawyer with whom I consulted earlier. She lets me know she will come in the next day to meet with me. She says the Arizona courts are overloaded, and it may be a month before I have a hearing and am allowed another phone call. She offers to call my friends and family. I start giving her phone numbers for mother and father, brother, another lawyer, and a few of my closest friends. I begin to cry, exhausted, imagining life in prison as I wait for the legal system to process my case. That is the last moment my friends from San Miguel see me. As I cry at the phone, they are taken away, put on a bus, and deported back to Mexico. After my phone call, I am taken back to my cell. I wonder how my Triqui friends are being treated. I am forced to look at the wall on the other side of my cell and not allowed to look out my cell's window, even after my Triqui companions are gone. I want to use the toilet but avoid it since the toilet is in the open for everyone to see at the end of my cell. Besides, there is no toilet paper in the cell. In addition, I am starting to feel hungry and thirsty. Again, I remember reading that Border Patrol detainees have the right to food and drink every six hours during detention. I look at the clock on the wall. It has been over eight hours. I remember the cold responses I received asking for my phone call through the window and decide not to try. I am deeply relieved when an agent comes to my cell and lets me know they decided not to prosecute me with smuggling and would be giving me simply the $5,000 fine for Entry Without Inspection. I wonder to myself who made this decision and want to thank them for being reasonable, saving their own time and mine. I ask for something to drink and eat and some toilet paper. He comes back with six crackers and a tiny bottle of an orange-colored drink (with 0% juice, according to the label), no toilet paper. On my way out, I file a formal complaint against the two officers who did not let me call my lawyer. The manager taking my complaint asks me three times, "You do understand the nature of your crime, right?" It seems that she feels the need to remind me that I am the one in the wrong, not the Border Patrol agents. I wonder why law enforcement officers seem often to lack respect for the other human with whom they are interacting. I wonder how I will pay the fine. I wonder how my Triqui friends are doing and how it would feel to know you had to attempt the long trek again. "Is It Worth Risking Your Life?" In much public health and global health discourse, as in the case of border death, the focus remains on individual risk behaviors. In much of the mainstream media, migrant workers are seen as deserving their fates, even untimely deaths, because they are understood to have chosen voluntarily to cross the border for their own economic gain. However, as pointed out above, my Triqui companions explain that they are forced to cross the border. In addition, the distinction between economic and political migration is often blurry in the context of international policies enforcing neoliberal free markets as well as active military repression of indigenous people who seek collective socioeconomic improvement in southern Mexico. Especially important is the U.S.-initiated North American Free Trade Agreement (NAFTA) banning economic barriers, including tariffs, between signatory countries. Thus, the Mexican government was forced to erase tariffs, including that on corn, the primary crop produced by indigenous families in southern Mexico. However, NAFTA and other free trade policies do not ban government subsidies. Thus the U.S. government was allowed to increase corn subsidies year after year, effectively enacting an inverse tariff against Mexican corn. In addition, such subsidies are only possible for relatively wealthy countries and could not be enacted by the relatively poor Mexican government. During my fieldwork in San Miguel, I watched genetically engineered, corporately grown corn from the U.S. Midwest underselling local, family-grown corn in the same village. How can the immense dangers on the border be worth the risk? On the other side of the equation are heartless global politics and economic markets. At this point, staying in San Miguel means not having enough money for food and not being able to buy the school uniforms required to allow your children to attend public schools. The calculus involves slow but certain death on one side of the equation and immense risks on the other. Staying in San Miguel without sending a family member north involves a slow, communal death by the unequal, "free" market. Staying in San Miguel today means putting your life at risk, slowly and surely. It is critically important for anthropologists as well as global and public health professionals to reframe suffering, death, and risk to incorporate analyses of social, political, and economic structures. In order to ameliorate suffering and death in the borderlands, we must focus together on the legal and political apparatuses that produce labor migration in the first place. Policies that shore up inequalities, like NAFTA and the Central American Free Trade Agreement (CAFTA), must be renegotiated and health reform legislation must be broadened to include structurally vulnerable populations, such as migrants. Without this reframing, we will continue to see not only an externalization of the costs of reproduction but also an individualization of risk and responsibility. When risk and blame are individualized, the solutions imagined and interventions planned focus on changing the behavior of the individual. However, attempting to intervene on individual behavior in such contexts draws attention away from the structural forces producing mortal danger and death in the first place. Without reorienting our understanding of risk and our subsequent interventions, we will continue to witness hundreds of human beings dying each year in the borderlands and suffering throughout the rest of their migration circuits. After calling an acquaintance in Phoenix, I walk through the deserted town in the dark to a Greyhound bus station and catch a Phoenix-bound bus. I rest three days in the house of this acquaintance-who, ironically, studies and writes about border death-recovering from the trip physically and emotionally. There is an intense thunderstorm with downpours of rain and flooding, and I worry for the safety and health of my friends if they are again in the desert. Not knowing what else to do, I fly back to California a few days later. I wait in California, calling Macario's cell phone every few days to see if I could reach him. One of my anthropology classmates offers to throw a fund-raising party for me to help me pay off my fine. The party never happens, but the offer feels supportive. After a week, my Triqui companions arrive in Madera, California. One of the younger men does not make it back during my fieldwork because he does not have money to pay the coyote and drivers a second time. Instead, he returns to his family in Oaxaca. When Macario and I meet again in Madera the next week, he tells me that he suffered a lot crossing the second time. He briefly speaks of blisters and more rattlesnakes, but he does not want to talk much about it because he is afraid others would make fun of him for not being tougher. He shows me the large, popped blisters on his feet and the holes in his socks. He tells me that a couple of the guys in the group blamed me for bringing bad luck. He also says that just as they were being deported, arriving at the border in Nogales, Arizona, the driver of the Border Patrol bus turned around. He took them back to the station and had them sign a statement in English that they could not read. They were told it said that I was their friend, had lived in their hometown, and was not a coyote. They finally arrived in Mexico well after dark. Although I have written this book with the primary format of substantial chapters, I attempt to present the unfolding narrative nature of the experience of migration. This strategy demonstrates the everyday joys and suffering involved in migration as well as the bodily experiences of multisited fieldwork in transit. Conversations, interviews, and quotes are based on either tape recordings or my own handwritten and typed notes. Translations are my own unless otherwise noted. While I have changed the names of the people and some places described in this book to protect the identities of those who entrusted me with entrée into their lives, I maintain to the best of my ability the details and richness of real experiences and observations throughout. In Chapter 2, I explore the critical significance of understanding U.S.-Mexico migration as well as the importance of an ethnography that focuses not only on the bodies of the people under study but also the body of the anthropologist. In Chapter 3, I describe firsthand the labor segregation in American agriculture that leads to highly structured hierarchies of ethnicity, citizenship, and suffering. Here I use ethnicity not as a genetic or biological given but as a somatic and social category. As described by Mary Weismantel and others, the social and economic histories of people not only reshape their bodies over time but also shape the perceptions of those bodies in such a way as to establish their ethnicity. In addition, ethnicity can be understood to be something akin to Althusser's concept of interpellation, in which a human subject is positioned by social and economic structures in a specific category within power hierarchies and simultaneously recognizes oneself and others to be members of these specific categories. Sickness as the embodiment of violence is the focus of the fourth chapter, drawing on the experiences of three Triqui migrant laborers to show that illness is often the manifestation of structural, symbolic, and political violence, as well as, at times, resistance and rebellion. Chapter 5 endeavors to make sense of the acontextual lenses through which physicians and nurses see the plights of their migrant patients and, thereby, inadvertently add insult to injury by blaming the victims of structural inequalities. Chapter 6 considers the crucial issue of how such hierarchies become taken for granted by analyzing the normalization of social and health inequalities as an example of symbolic violence. For those at each rung of the social ladder, perceptions and assumptions naturalize the position of those above, of those below, and-perhaps more disturbingly-of one's own group and oneself. This chapter prompts worries about representations of marginalized people, keeping in mind the important critiques of the "culture of poverty." However, along with Philippe Bourgois, I believe it is important to portray marginalized people as full human beings, showing the odds and prejudices they are up against. The conclusion of this book deals with the future for Triqui migrants, the possibility of hope, and the difficulty of resistance and change. It issues a call to listen to migrant laborers, enact solidarity with their social movements, and work toward equality at multiple levels from micro farm practices to macro global issues. I attempt to portray and analyze the lives and experiences of Macario and my other Triqui companions in order to understand better the social and symbolic context of suffering among migrant laborers. I hope that understanding the mechanisms by which certain classes of people become written off and social inequalities become taken for granted will play a part in undoing these very mechanisms and the structures of which they are part. It is my hope that those who read these pages will be moved in mutual humanity, such that representations of and policies toward migrant laborers become more humane, just, and responsive to migrant laborers as people themselves. The American public could begin to see Mexican migrant workers as fellow humans, skilled and hard workers, people treated unfairly with the odds against them. I hope these recognitions will change public opinion and employer and clinical practices, as well as policies related to economics, immigration, and labor. In addition, I hope this book will help anthropologists and other social scientists understand the ways in which perception, social hierarchy, and naturalization work more broadly. With these hopes in mind, I invite you, the reader, into the journey of migration along with me, Macario, and the other indigenous Mexican farmworkers in these pages. Fresh Fruit, Broken Bodies provides an intimate examination of the everyday lives and suffering of Mexican migrants in our contemporary food system. An anthropologist and MD in the mold of Paul Farmer and Didier Fassin, Holmes shows how market forces, anti-immigrant sentiment, and racism undermine health and health care. Holmes’s material is visceral and powerful. He trekked with his companions illegally through the desert into Arizona and was jailed with them before they were deported. He lived with indigenous families in the mountains of Oaxaca and in farm labor camps in the U.S., planted and harvested corn, picked strawberries, and accompanied sick workers to clinics and hospitals. This “embodied anthropology” deepens our theoretical understanding of the ways in which social inequalities and suffering come to be perceived as normal and natural in society and in health care. All of the book award money and royalties from the sales of this book have been donated to farm worker unions, farm worker organizations and farm worker projects in consultation with farm workers who appear in the book. Seth M. Holmes is an anthropologist and physician. He received his PhD in Medical Anthropology from the University of California, Berkeley and San Francisco, and his M.D. from the University of California, San Francisco. He is Martin Sisters Endowed Chair Assistant Professor of Public Health and Medical Anthropology at the University of California, Berkeley. Philippe Bourgois is Richard Perry University Professor of Anthropology and Family & Community Medicine at the University of Pennsylvania and author, among other books of In Search of Respect (Cambridge, 2000) and Righteous Dopefiend (UC Press, 2010). "In Fresh Fruit, Broken Bodies, Seth Holmes offers up an important and captivating new ethnography, linking the structural violence inherent in the migrant labor system in the United States to the social processes by which it becomes normalized. Drawing on five years of fieldwork among the Triqui people from Oaxaca, Mexico, Holmes investigates local understandings of suffering and illness, casting into relief stereotypes and prejudices that he ties to the transnational labor that puts cheap food on American tables. 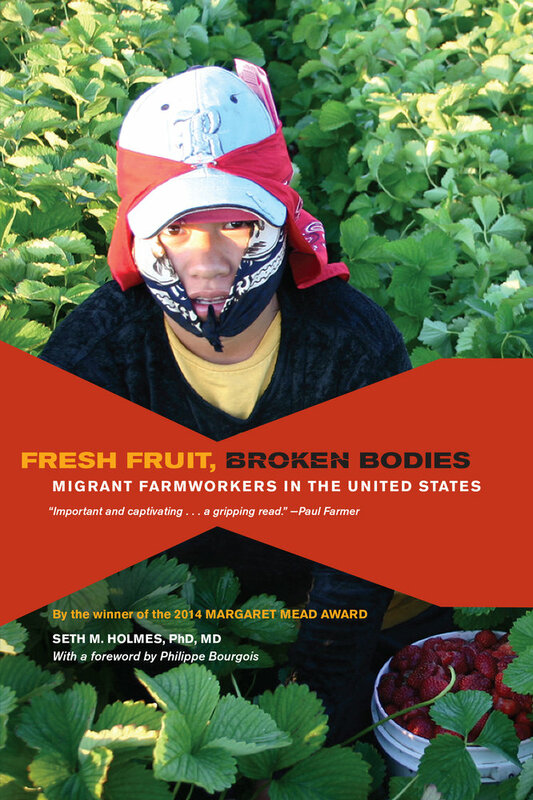 Throughout this compelling volume, Holmes considers ways of engaging migrant farm workers and allies that might help disrupt exploitation that reaches across national boundaries and can too often be hidden away. This book is a gripping read not only for cultural and medical anthropologists, immigration and ethnic studies students, students of labor and agriculture, physicians and public health professionals, but also anyone interested in the lives and well-being of the people providing them cheap, fresh fruit. "—Paul Farmer, Co-founder of Partners In Health and Chair of the Department of Global Health and Social Medicine at Harvard Medical School. "Provides a unique understanding of the political economy of migrant labor and of its human cost. "—Didier Fassin is Professor of Social Science at the Institute for Advanced Study, Princeton, and the author of Humanitarian Reason.